We start with both the collages of the things on young Kaito’s mind at the time of the story and the interior of Inspector Nakamori’s bedroom. As a word of warning, when you read this, you have to remember that this takes place before Toichi Kuroba gets killed during one of his performances, so Kaito still has someone near and dear to him who can teach him magic. 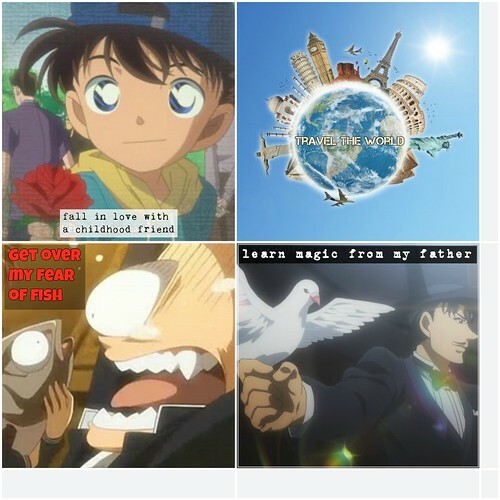 My opening collage of this project, a send-up of “Love at First Shot,” puts a strong focus on Kaito’s seven-year-old mind: He wants to learn stage magic from his father because he wants to be as successful a magician as he is when he grows up; he wants to travel around the world to show off his talents because, as young as he is, he already has the confidence to pull off his tricks in front of whoever happens to be in his audience at any given time; he wants to fall in love with a childhood friend because the ideals Kaito has in his youth never really went away after his dad’s death, to the point that several chapters of the manga have hinted that Aoko might be Kaito’s one true love, after all; and he wants to find a way to get over his deathly case of ichthyophobia – the fear of fish – because it seems to be one of Kaito’s more comedic character flaws, so much so that it also serves as the basis for a minor running gag in manga and anime appearances. The inspiration for this was the “Bucket List” challenge, worth three-and-a-half stars as of press time, and was the result of looking up various public-domain images of Kaito as a child and teenager, as well as his late father, Toichi, during one of his magic shows, to say nothing of the image of various oversized versions of world landmarks on an image of the world. These images were compiled during various searches on Google Images, Bing Images, and even Yahoo! Images, at one point. Uploading them onto the web site, BeFunky.com, allowed me to play with them until I got all the pictures centered, and the necessary words typed out; I saved my collage as soon as I was satisfied with the final product, before ultimately turning it in to Flickr. The glass door is a nod to both the Nakamori and Kuroba estates in the anime having glass doors, to provide further continuity between the manga and anime versions of the story. The rest of the place, including several wall paintings and an old-school telephone, flex and all, ties back to Ginzo being an old soul, with a “thrill of the hunt” mindset during cases, especially those where the Kid is the culprit. The reason why is featured in the Christmas episode of the anime, in which Ginzo pleads to Kid – unaware of the new face under the old monocle and top hat – not to leave him the way he did eight years ago, an event that happens to be foreshadowed in my story. Yes, the blood will be cleaned up afterwards, and yes, Ginzo still won’t change the design of the place; he’ll simply paint over the bloodstains and leave it at that. Familiarity may breed contempt, but then again, it’s the job of officers of the Tokyo Metropolitan Police Department to keep all those who hold such contempt from causing any damage, so the trade-off is rather fair to Inspector Nakamori. Once again, I published everything on Flickr once everything was properly saved and uploaded in the usual manner. This brings us to my entry in the Design category, a full-on return to one of my more interesting assignments, based on one of my favorite movies: “Designception.” For this one, I needed to recreate the image of the revolver, resting in a carrying case, on top of a dresser. 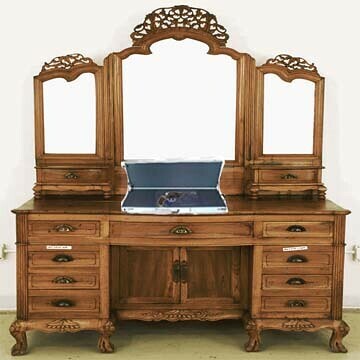 After finding a public-domain picture of an Oriental dresser on the web site, Silk Road Collection, along with two more photos of an aluminum carrying case and a Type 26 revolver, I went to work sizing everything up, so that the final image was as exactly to scale as the situation called for, using Photoshop. After that, I saved the final image before, once again, uploading it all on Flickr. 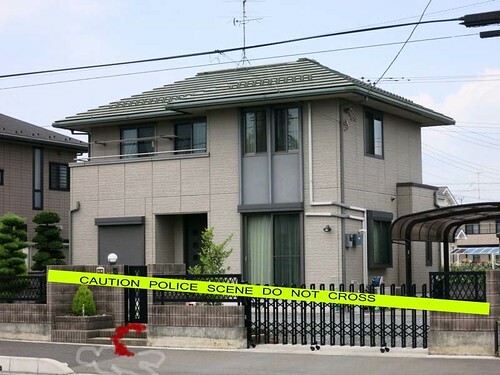 Since we were also given permission to choose original assignments for our respective stories, mine was turning the exterior of the Nakamori estate into a legitimate crime scene, following the abrupt assassination attempt in this story. Finding a stock photo of a modern Japanese household was easy enough, once I found the right site, and with the minor edits I made in Photoshop, it honestly felt like the aftermath of an event that nearly resulted in the premature end of a young boy’s life. There was even a blood trail leading to the house, that Kaito left behind as he and the Nakamoris headed to the ambulance, next to a faded “chalk angel.” Couple that with some old-fashioned yellow police tape blocking the entranceway to the house, and we have a crime scene. As always, as soon as I was satisfied with this piece of the puzzle, I saved it on my hard drive, and uploaded it to my Flickr account. This is a completely original work, done just for this assignment. The audio and video assignments were actually the toughest ones of the bunch for me, primarily because of how tough it was to find the necessary footage for the video, while typing up the script for the audio. I pulled through on all three counts, however, as you’ll soon see, and hear. First up, we have “The Many (Poker) Faces of Kaito Kuroba,” in which the Kaitou Kid becomes Derek Zoolander for a moment, and shows us four(teen) versions of the Kuroba clan’s most famous look. Using various public-domain photos of the current Kaitou Kid, both in and out of his signature outfit, as well as in disguise in a few cases, I was able to use both VideoPad Video Editor and Windows Live Movie Maker to create a short montage of Kaito’s version of the “Poker Face” at work. Unlike the original Zoolander movie from 2001, which used names like Blue Steel, Ferrari, Le Tigre and Magnum, Kaito’s variations of the Poker Face were named after the members of the J.A.K.Q. team, from the 1977 tokusatsu series, J.A.K.Q. Dengekitai. I even sampled the members’ voices from an actual episode of the show to do the intro for each piece, as well as a live version of the show’s theme song, performed during the Super Sentai Spirits concert in 2006, to serve as background music. Suffice it to say, I needed to make a lot of visits to SaveClipBro.com, in order to find the necessary samples, before editing them down using Audacity. I also attempted to do a conversation with myself when doing this list, as I did an impression of former TV Burp host Harry Hill for the introductions, and described each look with my normal voice. Suffice it to say, a lot of effort went into making this particular video, as it serves as a representation of Kaito practicing his “Poker Face” before he has to use it, for the first time, later on in the story. After another round of editing and uploading, I turned my final product in on YouTube. This was a continuation of a combination of previous tasks, including “Rewrite This Story,” for 4.5 stars; “‘Cut,’ Print…Moving On,” for 5.0 stars; “On the ‘Road’ Again,” for 4.5 stars; and “Time for Something Biblical;” for 5.0 stars. These scores averaged out to 4.75 stars, which would translate to 4.5 stars in the Assignment Bank, but I’m rounding up the scores, just to be sure. My second video was a reenactment of the exact moment when Kaito jumps in front of Aoko’s bullet, taking the hit in Ginzo’s place. Since there are very few bits of footage that could fit the bill exactly, and since Magic Kaito was as much about the comedy as it was about the drama, I decided to go for a spoof reenactment. Using SaveClipBro to download a YouTube video, in which someone jumps in front of “several” bullets, I then turned to VideoPad Video Editor to play the footage in full for the first take, before I slowed down the second, making an “instant replay” of the moment that the stand-in for Kaito was shot. After the editing was complete, I saved the final product, and uploaded it all on my YouTube channel. Finally, there was the audio, and I knew that if there was going to be a murder attempt at the Nakamori house, then someone was going to have to call the hospital for an ambulance; since Ginzo was the only one in that building over the age of eight at the time, let alone eighteen, that meant he was the only one who was able to contact local emergency services in time. This final assignment was a send-up of the “One-Man Play” I did in the earlier weeks of this semester, as now I was attempting to play a female receptionist, in the same vein as Janine Melnitz from Ghostbusters, while also attempting to put on a husky voice, to play Inspector Nakamori, as he makes the call. This assignment was actually based on a task where someone had to call the police for something, but since Ginzo already works for the police, he has to call “119” for an ambulance, instead of “110” for his own men. That’s because I used the Japanese numbers for emergency services in the script for this audio, adding to the story’s authenticity; the archipelago of Japan is a nation that has next to no gun-related murders nowadays, and thus, an assassination attempt, especially one of a known celebrity’s child, would cause quite an uproar the next morning. As for the script itself, I decided to do what I did in the original “One-Man Play,” and follow another one I found on the Internet, which is similar to the type that’s printed on pieces of paper small children are handed during classes, so they get to know how to call such services responsibly. The moment I was satisfied with what I had – primarily after editing the addresses and phone number to keep to the Japanese aesthetic – I recorded both halves of my performance using Audacity, before editing it all down to sound like a legitimate “911” call; the English language in a Japanese setting makes sense, once you realize that in several branches of Tokyo, authorities are recommended to speak several other languages outside of their native tongue, with English chief among them. After everything was completed, and I was satisfied with what I heard, I saved the final product, turning it in using my SoundCloud account. Overall, these challenges make for a great prologue for the events of the Magic Kaito franchise, and with a grand total of 25.5 stars in the “Inspiration” category, and between 26 and 26.5 stars when ranking all of the past works that went into this project – depending on the ranking system for these kinds of final exams – I can safely say that this project passes its inspection with flying colors. The comedy and drama meld together in a way that doesn’t overpower the influences of one genre or another; the situation is, sadly, relatable to anyone who’s at least heard of a gun-toting maniac in a news story recently, while still being handled with a deft touch; and it all builds up to Toichi’s death, and the start of the series proper, while keeping spoilers for future events to a minimum. Suffice it to say, you’ll have to read the manga, watch the anime, or both, if you want to find out where all of this is heading. Well, there’s still one final entry left for me to publish here at #DS106, and it’s the big one – my end-of-semester wrap-up. I’ll see you there, once I get all of my packing done.